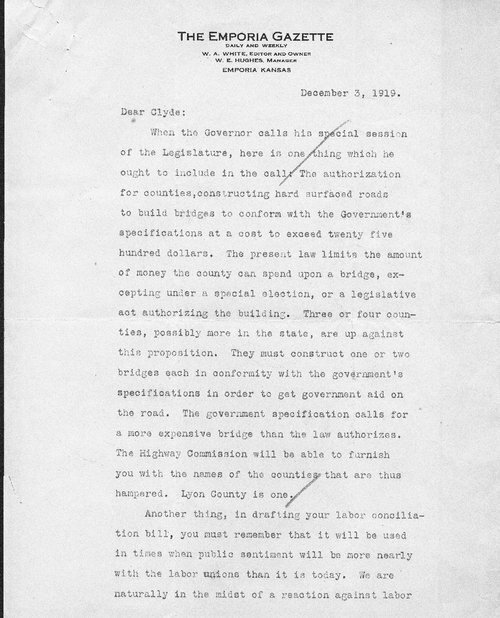 William Allen White writes to Clyde Reed, Secretary to Governor Henry Allen, about the proposed Industrial Court Bill. White asks that consideration be given to road construction in the fact that counties are only allotted so much money for road construction but the government specifications require more expensive bridges than counties can afford. Also, White informs Reed that the labor conciliation bill that's being drafted must fit the negative feeling the general public had for the labor unions as well as for any future change of attitude that the public would develop.